Make sure that the tendon is not torn through and through. If it is severed, you must see a doctor immediately so that the tendon can be repaired. Severe injuries can sever a tendon, without a skin laceration being present. Testing involves moving the toes and foot to see if the tendon moves. If the tendon does not appear to move, it may be severed (comparing the injured tendon and its movement to the same tendon on the uninjured foot may help). 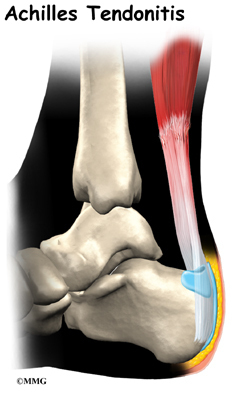 Very sharp pain, a sudden pop, or an obvious gap in the structure of the tendon are all signs of a rupture, and should be seen by a doctor as soon as possible. If there is extreme swelling of the leg, and pain (out of proportion to the amount of trauma received), you may have sustained a vascular injury. A doctor must see this type of injury immediately. If you are not sure, see a doctor. If you have multiple injured areas see a doctor immediately, in order to prevent excessive swelling and pain. If the above exam is negative, then you may proceed with self-treatment. (However, if you are not sure of the extent of your injury, you should consult your doctor immediately). The sooner you begin to treat your injury by following "R.I.C.E. ", the better you will feel. Rest is very important. Take off your shoe, get off your feet, and relax. Ice should be applied as soon as possible. Never apply ice directly on the injured area, as the cold may make the pain worse. Ice should be applied close to the injured site, between the heart and the injury, so that as the blood flows under the ice, it will be cooled. This cool blood flowing into the injured area will help to reduce the swelling and pain. Apply the ice, wrapped in a cloth or over an elastic bandage, to the foot for 15 minutes, every 1-2 hours, for up to 3 days after an injury. If the ice is uncomfortable, or causes increased pain, do not continue to use it, and see a doctor. If you have poor circulation do not use ice, as this may cause a serious problem. c. Compression is used to limit swelling, and to give support to the injured area. Compression should be applied to the entire foot, starting first at the toes and working back to the ankle. If it is applied just to the injured area, increased swelling will occur in front and behind the wrapping. Compression should be applied with a 3-inch elastic bandage, beginning around the base of all the toes, and then going around the foot and ankle. Continue over the calf muscle when possible. Compression reduces motion in the injured area and foot, and this decreases the pain, and allows for quicker healing. The bandage should not be so tight that it causes increased pain or throbbing in the toes or foot. It should be comfortable! Do not remove the elastic bandage for the first 12 hours, unless it becomes too tight, or the pain increases, or the toes become pale, blue, or cool. If any of these things happen, immediately remove all bandages, and leave them off for several hours. The normal color and temperature of the toes should return immediately. If not, see a doctor immediately! Continue until the swelling and pain subsides; it could take from several days to several weeks. d. Elevation of the leg will aid in reducing swelling and pain. Blood rushes to an injured area to bring increased blood cells, that aid in healing. Gravity will also force blood to the injured area. Too many cells and too much fluid will apply pressure to the injured nerves and tissues, and cause increased pain and delayed healing. Keep your foot elevated so that it is at least parallel to the ground, or higher if it is comfortable. Do this for at least 48 hours, or until the throbbing subsides, when you lower the leg.